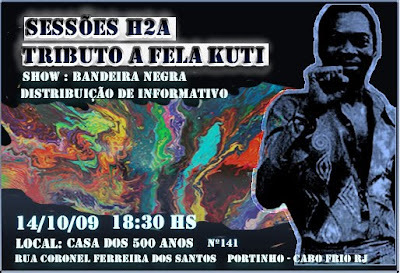 Fela is far more celebrated in public culture in Brasil than he is in Nigeria, as these publicity images for various events around the country celebrating Fela this month show (only the Kuti family celebrated the anniversary of his death this month via the Felabration at the Shrine). While Fela is widely celebrated amongst the poor (at least in the South-West), the middle-classes/elite are often conflicted. On the one hand, there is a sense that Fela was a man of immense courage in search of the truth, railing against the political greed of his day. On the other hand, the image of a man in his underpants with a huge spliff in his mouth and 27 face-painted wives doesn't cohere that easily with being a member of RCCG or a God-fearing stance in a similar hallowed chamber (or cattle shed). Brasil: Nigeria without the religious hypocrisy? "On the other hand, the image of a man in his underpants with a huge spliff in his mouth and 27 face-painted wives doesn't cohere that easily with being a member of RCCG or a God-fearing stance in a similar hallowed chamber (or cattle shed). Brasil: Nigeria without the religious hypocrisy?" Oga jeremy, you also forgot the most important factor that most Nigerians don't like Fela...its because he is a "local" artiste. Nigerians suffer from what the man called "Colo Mentality": the mentality that anything african is very inferior compared to anything western and that is the real truth. How the heck can you explain why some parents forbid there children from speaking there native language. So very tragic. Why do you keep comparing Brazil with Nigeria? Time and time again, you do. The two countries are light years apart. Brazil is finally waking up to it's potential and is confidently striding to take it's rightful place amongst the emerging powers of the world, witness their successful bid to host the Olympics is testimony to that. Their growing economic clout, their humble president. Their projection of soft-power throughout the Americas witness their intervention in Haiti and Honduras. Brazil is part of the New World and is not wedded to many dogmatic traditions. Nigeria is the opposite, they want to take their place amongst the powers without doing the hard-yards. The country is mired in conservative beliefs, which it is finding increasingly difficult to cast off. This can be attributable to an unhealthy hang-up on religion and ethnicity. You can't compare Brazil with Nigeria. Brazil is on the "up and up" and Nigeria at best is stagnating at worst sinking into the dark ages. Brazil is a liberal democracy, the same can't be said of Nigeria.